More bad news affecting the investment industry came out this past quarter – asset outflows, fee pressure, fund shutdowns. The financial pages read as bleakly as the front pages covering the Presidential race. In this edition of our Newsletter, we look at how these industry factors are affecting the way front-office professionals are thinking about their compensation. We also look at a couple of the brighter spots of industry hiring, in terms of analysts and data scientists. Fund performance has continued to be positive in recent months (+3.5% throughout Q316 according to the Barclay Hedge Fund Index), so there’s perhaps some hope for blue sky behind the clouds. And for those funds brave enough or capable of bringing people on, they are able to attract some stellar candidates currently. Over 500 investment professionals (currently at fundamentally driven public investment firms) responded to an online survey from Odyssey Search in September of 2016. 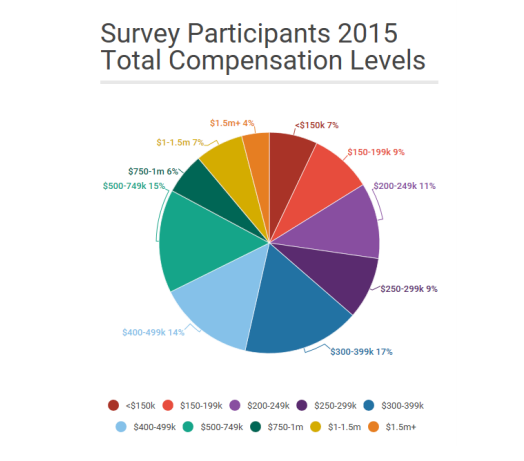 Respondents were asked about their specific role, the firm they represent, past compensation history, and expectations for 2016. It’s no secret that investment professionals are a well-paid bunch relative to the average American. That’s what you get for sitting 80 hours a week in front of a Bloomberg. But Wall Street may want to brace itself, as the investment professionals we surveyed are expecting a tough bonus season for the fiscal year ending 2016. Full-year compensation packages are expected to be almost 10% below the $570k average in 2015. That’s including a 3% bump in average base salary, from $168k in 2015 to $173k this year. Given that year-end bonuses account for the majority of an employee’s compensation, industry cuts in bonuses will have an outsized effect on overall compensation. Unfortunately, there remains an expectation-gap in the minds of professionals whose bonuses are discretionary. Looking at professionals with at least 5 years of experience (given that juniors with less than 5 years rarely receive a formula-based percentage), those with payouts at least partially formula-based expect their compensation to decline drastically, by a whopping 21% on average. This pessimistic viewpoint is justified, given the poor industry performance of 2016. However, those who receive a purely discretionary bonus are actually expecting their compensation to rise by an average of 5% this year. Their optimism stems from their presumption that management will dip into its fee structure in cases where performance fees have not been earned. If history is any guide, those with such a rosy outlook are likely in for a rude awakening.